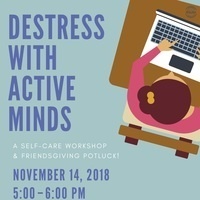 Join Active Minds to de-stress as we get closer and closer to the end of the semester! At this self-care workship, we'll be having a Friendsgiving Potluck while we put together de-stress goodie bags for us to hand out later this month. Free food, quality time to relax and help give back, and good company - what more can you ask for? You don't want to miss this!